Athlete endorsement is nothing new, whether its Nike ownership of the once evergreen Tiger Woods to Kellogg’s deal which saw Bruce Jenner as the face of the cereal through the 1970’s. What is new however is the success which Under Armour is delivering against its more established, been-there-and-done-it, global rivals Adidas & Nike. Not to be misquoted, it is worth acknowledging that Under Armour also has a cohort of team sponsorships with Wales RFU and Tottenham Hotspur FC, however it is the roster of athlete endorsements which has seen the brand break the sporting apparel duopoly. One of the most recent acquisitions provides a great case study on the brands strategy and the proliferation of athlete owned platforms, Under Armour’s sponsorship of Dwayne ‘The Rock’ Johnson. The accomplished actor/sportsman/fitness star/ social media sensation is now an Under Armour Ambassador. With one look at The Rock’s owned Instagram account it is easy for the 51.2m followers to see the brands integration across both gym and lifestyle apparel. In addition, The Rock has worked with Under Armour to design his own exclusive, limited edition range, self-titled ‘Project Rock’. Utilising both the brand and The Rock’s audiences these products have been seeded across multiple channels, with The Rock showcasing the equipment on Instagram prior to its release on the ecommerce area of UA’s website further supporting the hype. Clearly this strategy provided successful returns with the first three released products selling out in minutes of being on sale. With the signing of The Rock it appears Under Armour have beaten the competition to the next ascending media megastar, with this tactic duplicated with a number of the other Under Armour talents (Jordan Spieth). Perhaps the rise of the brand and the subsequent affiliations are not as surprising as the fact that Nike and Adidas appears to not have provided a significant counter action to this activity. However, it is worth mentioning that Adidas is now looking to address this having reviewed its strategy (especially around the NBA) where it will opt out of renewing the NBA league sponsorship in favour of individual athlete endorsements, where it hopes to double its NBA athletes by the end of 2017. This is an area which one would assume brands would have a core focus on, after all there is a well-trodden tale of Nike’s turning point to megabrand when not so long ago the challenger brand secured the signature at all costs of a kid by the name of Michael Jordan beating out the dominant brands at the time, Adidas and Converse. Some may view this as an archaic model which the dominant brands of today have moved away from, however it might just be the pathway which Under Armour needs to become the next global megabrand. Fresh from the success of Snowboxx 2016 just this month, we thought this would be a great time to shine a light on how Snowboxx has utilised sponsorship to develop the event. Snowboxx is a week long snow escape combining the perfect ski holiday by day with the excitement and hype of a festival hosting world renowned DJ’s by night. Based in the picturesque resort of Avoriaz in France the festival has grown year on year, welcoming over 4,000 attendees to this alpine getaway. However when planning the 2016 event, Snowboxx faced a number of challenges which it felt were creating barriers to the event’s growth & customer experience. In order to overcome these challenges Slingshot worked with the sponsors to ensure all activation was curated to create a positive contribution to the identified areas, whilst supporting the on-point brand activity. This allowed sponsors to not only project their desired messaging but to also provide meaningful engagement to the festival and attendees alike. A key challenge to rights-holders is social media, the management of content and how to engage with the attendees in an engaging manner. As such Coors Light, the brand for ‘Damme cold’ refreshment had a huge focus on amplifying their sponsorship outside of the festival boundaries of France. With a thirst for content and social interaction Coors Light developed a social media centric campaign to support their sponsorship including the curation of a unique Coors Light Igloo Party, a Twitter competition to win tickets for the Igloo Party, in addition to the chance to win a trip to Snowboxx courtesy of Coors Light – now that’s refreshing! Ensuring an event is reaching new audiences and providing unique experiences are key to growth and attendee retention. With a platform seemingly made for Rockstar who embody the spirit of music and adrenaline fueled activity, Snowboxx was able to benefit from the launch of the new Freeze product variety and the supporting campaign. Launching with striking point of sale creative across a number of key retailers both inside and outside of the UK, Rockstar offered customers the chance to win the ultimate VIP experiences at Snowboxx including accommodation, lift passes, flights and even onstage viewing during the acts. In addition to this Rockstar was onsite throughout the festival providing the added revival to all the attendees for the long slope days and late nights at the main stage. 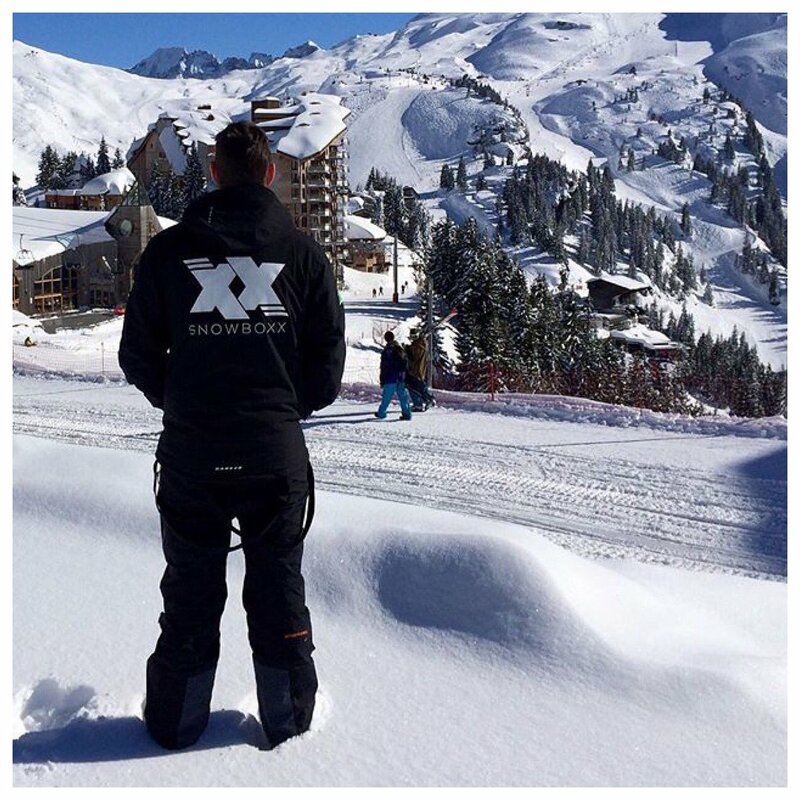 In a unique development for winter festivals, Snowboxx 2016 introduced a festival village within the heart of Avoriaz in addition to hosting bars and clubs across the resort. Due to the sprawling site it was imperative that the customer experience wasn’t impaired by the cold or misdirection. As the official clothing partner of Snowboxx 2016 Dare2B wanted to align with the youthful winter sport market and be seen as the equipment of choice for the slopes. By providing the clothing for all onsite staff Dare2B had over 70 branded customer service reps roaming the resort. Captivating an audience outside of the core entertainment schedule is a challenge not only restricted to the festival scene. Highlighting the periods of most downtime for attendees Jungfrau hosted activity from the Jungfrau Igloo atop the main festival site, to be the saviour for all those forgotten, hats, hip flasks and shot glasses. Through the festival Jungfrau provided refreshments throughout the down days with sampling whilst providing attendees with branded merchandise including glasses, bobble hats and the ‘piste’ de resistance, the Jungfrau branded shot ski’s revered by all the attendees’ onsite. 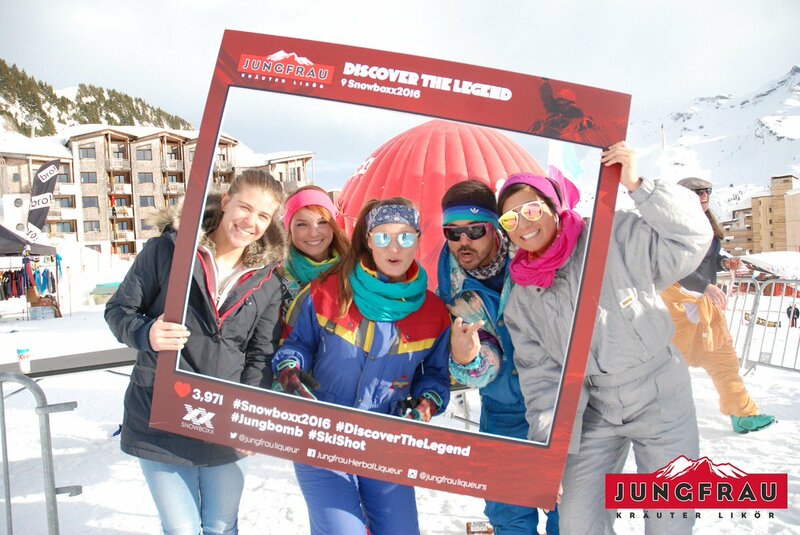 This coupled with an engaging social team to support and interact with all captured content allowed Jungfrau and Snowboxx to connect with the attendees outside of the core entertainment times. Snowboxx 2016 was met with roaring acclaim from attendees, with one group describing it as “the best week of their lives” whilst on the final chair lift. No doubt with the increasing allocation of tickets next year the event is sure to sell out once again. So much emphasis is focused on alternative revenue when right-holders initially look to secure sponsorship, rarely are the other benefits spoken of until this topic is exhausted. However when looking at the challenges or weaknesses in your own platform you can utilise sponsor expertise to help upgrade this thinking much below the initial surge in the bank balance. E-Sports are fast becoming more popular as both a competitor and spectator sport in the West, with Wembley Arena playing host to large events such as League of Legends and a dedicated e-gaming space currently being developed in Fulham. Despite numerous stalwarts’ draconian views and attempts to undermine the credibility of the platform, veteran e-sports journalist Rod Breslau commented in a VICE interview that it continues to surpass expectations in revenue and attention. A once tight knit community now draws in hundreds of thousands of attendees to events (surpassing many traditional sporting contests), eager to see their team take home cash prizes to $18million (The International 2015). Already USA and Korea have ‘appointed’ superstar players (Faker, NadeShot), with the success of KSI (he would be the first to point out he is not a ‘gamer’) in the UK when will mainstream brands see the e-sports as a credible, substantial marketing platform? Red Bull were the first major brand to act signing Dave ‘Walshy’ Walsh in 2006 however relatively few brands have followed. Venturing outside traditional endorsements to capitalise on the expanse of the platform, Red Bull developed training labs focusing on nurturing and developing the e-sports athletes of the future, cementing their position and long term commitment in the sport. E-sports is growing in size year on year with significant growth expected in 2016. The platform is already producing talent, major events and games which are capable of building and capturing a loyal fan base of elusive millennials. These can be reached through numerous, non-traditional channels including online streams and development YouTube channels, to note Matt ‘NadeShot’ Haag has over one million YouTube subscribers who follow his daily gaming sessions. Yet Europe has yet to find their e-sports star on the same pedestal as their Asian counterparts such as Sang-Hyeok Lee, who is constantly in discussions with native Chinese companies interested in partnering. There are a number of parallels with the growth of sports marketing in the 1970’s and the e-gaming platform of today with brands viewing the platform with trepidation as opposed to optimism. Brands should look towards e-sports as an exciting platform to engage with their market using all of the crucial buzz words of content and media coverage of the industry today (in 2014 over 70 million hours of content was captured from League of Legends online, with the BBC streaming the 2015 contest live on their IPlayer and Sport platforms). 2016 is set to be a monumental year for the growth of the e-sports industry, with tournament prize pools reaching up to $20 million and huge strides pending in the Western market. With new launches of multiplayer sensations (such as Overwatch, Battleborn) sponsors will have the ability to engage in real-time with the audience something which is rarely achieved through traditional sporting means. For those brands who position themselves as ground-breakers E-sports offers the perfect challenge. The only question is, who will click play? Money is almost always a closely guarded secret, whether between friends, business relations or colleagues. Nowhere is this more prevalent than the world of sports business with undisclosed fees for player transfers and the value of sponsorship deals rarely disclosed, so not to alert others to an inflated bank balance or be extorted for a fee. However, what happens when a company uses rights it has no possession of? This was the focus of an unusual dispute between Michael Jordan, Safeway and Jordan’s long-term sponsors Nike. Following Safeway’s unsolicited use of the Michael Jordan name without permission the two recently visited court to settle a proposed $10 million payment from a 2009 infringement. In 2009 a subsidiary of Safeway’s placed in an advert and coupon incorporating Jordan’s name and Chicago Bulls number within a commemorative Sports Illustrated issue (of which only two were ever redeemed). However Jordan’s lawyers and endorsement history advise that he would not have accepted such a deal. Safeway believed this should be in the region of $126,900, more widely reported as closer to $500,000 from a licencing agreement which MJ held at one point over the last decade. The argument posed by the athlete is that Jordan name is such a force in the marketing world that this requires a substantial rights fee, something he is keen to reinforce following a statement reporting an income of over $536 million in sponsorship alone from 2000 to 2012. This is where Nike and other sponsors take interest. As MJ and his legal team seek to prove how much an organisation typically purchases these rights leading to Judge John Blakely to rule that Nike and other sponsors must divulge their contracts to the court – something that they neither asked for, nor were keen to divulge to their competitors. Despite being desperate to retain the fiscal anonymity within Michael Jordan’s contract, (a document so closely guarded reportedly only three member of staff have access and it is held in a separate area to all other contractual agreements at the Nike headquarters) the judge ruled this must be shown to the court. The case is now settled with Safeway ordered to pay $8.6m in rights fees to Jordan, despite Michael expressing “it was never about the money”. 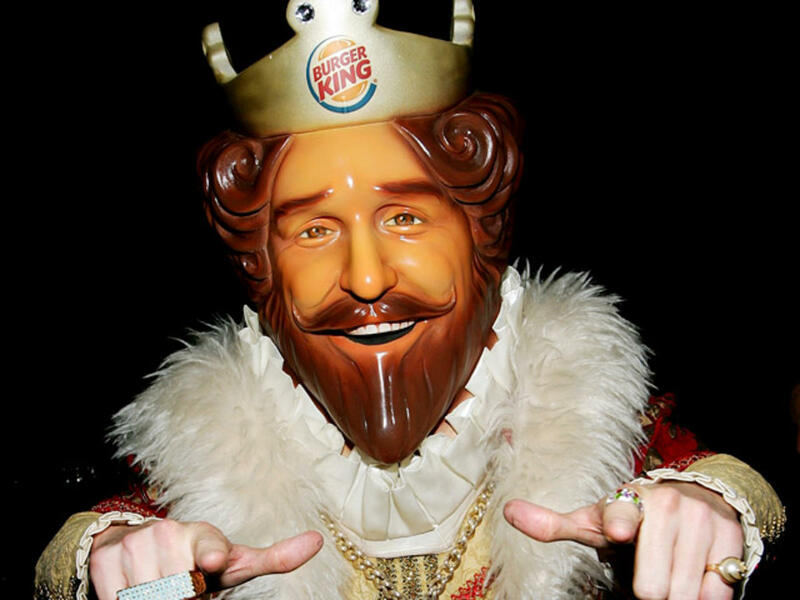 In the world of sponsorship it is always better to acquire those rights than use without permission – who knows it might just save you $8.1m in the long run. Player power is well documented across sports business with demands on endorsement deals, publicity requests and the ability to influence the many across the globe. However rarely has a player’s performance vindicated the price of company stock. As Serena Williams appears in New York this week with sights set firmly on the US Open & ‘Serena Slam’ (winning all four majors in the calendar year) there will likely be comparisons drawn with Jordan Spieth’s attempts to achieve the same feat in the world of golf this year. Following an examination of Spieth’s miss on the final hole at the British Open, ultimately ending hopes of the calendar Grand Slam the finance department of Serena’s sponsor Nike might be a little more focused on her success this week than the previous wins. Recently Under Armour became the principal sponsor of the young athlete, signing a multi-million 10 year deal (read more on a previous Slingshot blog here). Following this Spieth promptly returned faith securing the Masters and US Open titles with Under Armour equipment pride of place. Next the British Open loomed with hype surrounding Spieth’s opportunity to complete the impossible and collect a third major of the year. Jordan Spieth was in contention until the final hole where a birdie was required to keep the challenge alive for a play-off. This is where the parallels with Serena might interest Nike’s finance department and shareholders. As following the missed putt by their star ambassador, Under Armour’s share price dropped falling from a price of $89.46 before the putt to $88.79 minutes afterwards – decreasing the company’s value by almost £90 million. Whilst the exact nature of this depreciation is unknown, this occurred within the 6 minutes between the putt and missing of the play-off. Sport marketing professionals have cast views on the occurrence with Nigel Currie believing the “share price to have grown due to the accumulation of previous successes and the expectation on further success”, with the drop merely showing a return to a normal level. Whatever the explanation, Nike shareholders will be wishing Serena success at Flushing Meadows just a few percent more. As another part of our Day in the Life series we invite you to Pula, Croatia and the current site of Slingshot Sponsorship clients Outlook & Dimensions music festivals. Awaking to the near sound of silence (with most festival goers all recouping from the previous night’s antics) the team meet for breakfast at the festival’s staff area to discuss the sponsorship programme delivery so far, the plans for the coming 24 hours and to share any stories from last night (always entertaining!). Following breakfast the team retreat to the confines of their laptops to ensure all images, social media and admin are planned and in order for the day ahead. The rest of the morning is allocated to ensure delivery on any outstanding work from other client accounts, liaising with the team in London to stay up to date on any actions from head office. The early afternoon has been a flurry of activity each day with a host of tasks and favours called in, whether ushering VIP’s to locating an elusive set of keys the team are on hand to ensure all activation is running smoothly. One of the key features of Dimensions Festival is the Knowledge Area, an area where festival goers can create music, collaborate with each other and listen to acts and idols from across the festival talk about their experiences and deliver expert workshops. Sponsored by the likes of Native Instruments, Abelton and Urban Ears the team are busy setting up the necessary sponsor equipment, marketing information and ensuring all attendees are aware of the schedule for the day including the featured artist’s key note – a huge draw in the late afternoon. New Era’s key activation at Dimensions Festival is the artist lounge. A place for artists to relax, meet the crew and other artists as well as access the range of New Era merchandise available. The team are underway ensuring the lounge is still in pristine condition, stocked with all styles and set for tonight’s activation. Following dinner the team are briefed in and informed of any specific requirements. One section of the team are on hand at the Knowledge Arena to ensure the smooth change over from the workshop to the delivery of the artist key note speeches with a huge crowd set to listen to the legend George Clinton. The remaining team are on hand at The Clearing to welcome all artists to the lounge, mingle and capture content. Tonight there were specific requests from a number of artist from across the festival stages who asked for New Era caps for their onstage performance, which the team duly delivered and captured the content from. As the music continues until 6am, enough of the team are on hand for the rest of the night, a couple of members take the opportunity to visit a select stage or two of their favourite artists and join in the Dimensions vibe. With happy sponsors, well delivered activations and content captured from across the festival it’s time to retire to bed and catch a few hours’ sleep before it all begins again!